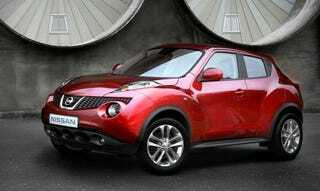 The Nissan Juke crossover will slot in below the Nissan Rogue in the U.S. lineup later this year and is either the next sporty, exciting off-road runabout or something as awkward as the Isuzu Vehicross without the performance. Despite its polarizing looks and, we're sure, underwhelming powertrain, this isn't a bad idea. We've been waiting for an automaker to nut up and give us a small SUV-like crossover that isn't the Freelander. Since we lack details we can be excited about it (AWD, VQ please?) until the Geneva Motor Show when it debuts and the New York Auto Show when our dreams are crushed.